The Highlight node allows you to brighten an image's area to simulate a light source. 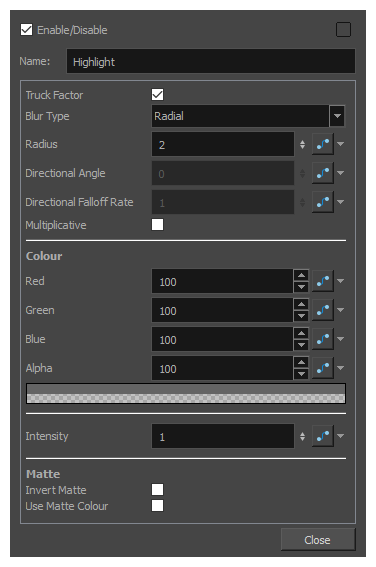 For this effect, you will need to create a matte to determine the shape and position of the highlight on a separate element, so that you can blur the edges to create a softer effect. By adjusting the Highlight properties, you can control the type and amount of blur, as well as the colour of the Highlight effect. NOTETo learn more about using the Highlight node, see Adding a Highlight to a Drawing. 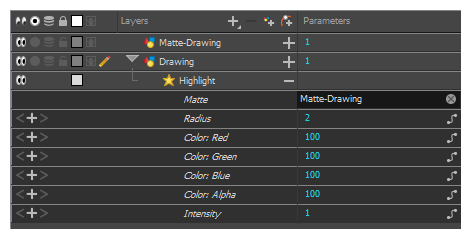 The Highlight effect layer must be connected as a child of the drawing layer or group which you want it to affect, and must have a matte drawing layer or group added to its Matte attribute. The part of its parent image that are covered by the matte drawing will have a highlight applied to it. The amount of red to add to the colour of the source image. The amount of green to add to the colour of the source image. The amount of blue to add to the colour of the source image.